Conversion rate optimisation (CRO) is the process of making changes to your website to improve the ratio of site visitors to customers. We analyse the way users interact with your website, and develop ideas on how to increase engagement and conversion rate through various tests and changes. A higher conversion rate results in a better ROI from every traffic source and campaign you run. It benefits every aspect of search marketing by increasing the value of every visitor to your site. The improvements are permanent so the value of each change continues long after the testing is complete. Even if you were to build a new website in five years’ time, you will have the conclusions from every test we run which forms a knowledge bank of best practice for your next website. Our conversion rate optimisation service will always be tailored to your individual needs, current site performance and commercial objectives. With this being the case, the tools that we use and the tests that we will conduct will vary from business-to-business. However, each CRO campaign will consist of a hypothesis report, ongoing testing and analysis with conclusions and recommended changes. Visual Website Optimizer (VWO) – We use VWO to run A/B and multivariate testing without coding or HTML. This means that you don’t need to change or update your website code every time you create an on-site test. VWO also has a powerful Landing Page Analyzer tool, a large community for usability testing and heatmap tools. We can utilise each of these during the planning and execution of our CRO tests. Google Analytics – Google Analytics collects detailed statistics about a website’s traffic and traffic sources and measures conversions and sales. Data from Google Analytics is monitored and evaluated for all aspects of the conversion rate optimisation process. Key insights from your Google Analytics profile are included in your monthly report, and your Account Manager will monitor this data closely throughout the campaign. In light of its ability to permanently increase your ratio of visitors to customers, CRO is rapidly becoming a primary focus within many search marketing strategies; if it isn’t yet integrated into your strategy, it’s likely that you’re leaving money on the table. Below is an example of how our CRO service can make a difference to your business. As you can see from the example, a 0.5% increase in conversion rate could make the difference of £17.5k in sales for a typical monthly budget. 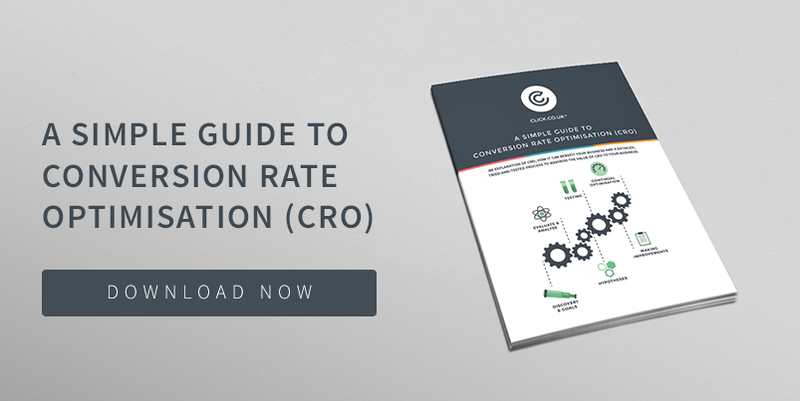 Pictured above: How CRO can make a difference to an average business.